Answer to the Age Old Question: Should I Feed My Dog People Food? What People Are Saying – Should I Feed My Dog People Food? As a dog owner it can sometimes be confusing about whether or not you can or should feed your dog people food in addition to their regular dog food. First of all let me say I love my own vet and he is very progressive and open-minded when it comes to what we feed our dogs. If the dogs are healthy and respond well to what we feed them, he’s all for it. But most vets are not nutritionists. They are more general practitioners. Diet and nutrition is just one part of their vast medical training and unless they decide to branch off and specialize in that area, I believe, you, the educated pet consumer, can often learn and know more about pet nutrition than your vet. Did you also know that many vet classes on nutrition are actually sponsored by the major pet food companies like Science Diet and Iams? Need I say more? And remember, before there was a Ralston Purina company or a Beneful, dogs have existed for thousands of years by eating a varied diet that includes the meat, bones and stomach contents of the animals they killed. 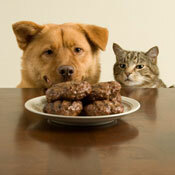 In this respect, dogs are true omnivores, unlike cats which are true carnivores. Of course, most self-respecting dogs would rather have a piece of steak than a carrot, but all together, a varied diet of proteins, vegetables and grains mimics what they eat in the wild like their closest relatives still do, the wolf. So that’s great for wild wolves you may be saying. But my little Fido has a delicate stomach. Well, assuming your dog does not have any food allergies or other health issues, the reason why they may not tolerate people food is because they are not used to it. Even switching dog foods abruptly after eating the same brand day after day for years (how boring is that?!) will cause some stomach upset. What I recommend is blending a little people food into your dog’s food on occasion. Adding pieces of lean chicken, beef, green beans, yams, pasta and brown rice into their bowl along with their wet or dry food is a good thing. How can feeding wholesome, real food be bad? It’s really common sense if you think about it. Feeding nothing but dry kibble day after day after day is often the cause of dry itchy skin, dandruff, hot spots and more. You know the term “doggie bag?” If you can’t finish that meal at the restaurant, by all means bring it home for Fido. Trust me, a little people food mixed in with the usual meal can go a long way toward keeping your dog healthy and happy for years to come! Gene Sower is the publisher of Natural Pets World, a blog dedicated to the health and wellness of pets. You can also follow them on Twitter at http://twitter.com/natpetsworld.